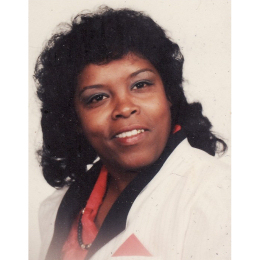 Out of Mobile, AL comes Jackie Moppins with her sad tale. Her voice sounds as mournful as the lyric of Your Hurting Day Is Gonna Come warrants, and the plodding background fits the mood well. The horns are slightly out of tune – but that only adds to the charm of the piece. Part two ofis almost completely instrumental than a continuation of this side. Really good to hear that southern soul like this flourished as late as 1975. I don’t know of any other cuts by Ms Moppins. UPDATE ~ I'm delighted to say that Jackie herself has been in touch. Not only has she very kindly given me some details of her life and singing career but also supplied the lovely photograph on this page. Jackie says that she was born and raised in Mobole, AL and started singing at the age of 6 in church, and began singing with a local group at the age of 14. Jackie wrote the song "Your Hurting Day Is Gonna Come" deep from her heart. The band's guitarist Charlie Bryant helped put the music together and the male voice in the song is keyboard player Clavin Bryant. Jackie's uncle Joe Lewis arranged the horns. 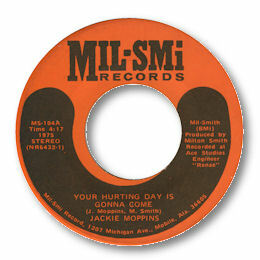 Although Jackie continued to sing until 1999 this Mil-Smi 45 was her only recording. I'm very grateful to Jackie for all her info.